LastPass and Dashlane both have everything you need to manage all your passwords and keep yourself safe online. They also just happen to come out top in our study of the best password managers for personal or business use. LastPass was crowned our best value password manager, while Dashlane topped the chart for the best password manager overall (and the go-to for small businesses). In general, LastPass is the most generous password manager you’ll find for free – it even has a free app, or you can enjoy all the VIP features for the small price of £1.50 a month. But Dashlane will be for you if you are looking for a premium password manager. Dashlane doesn’t just protect your private data, it even goes to lengths to prevent you ever becoming a victim of online fraud. Of course, the reality is a bit more colourful than that, which is why we’ve broken down every aspect of these leading password managers for you, so you can decide what matters most to you, or see for yourself with a free trial. LastPass vs Dashlane: How do I choose? So, is Dashlane or LastPass better? Both LastPass and Dashlane have more in common than differences. Both platforms use military-grade security, have a user-friendly interface, and make password management a breeze. Should you choose LastPass or Dashlane? Just ask yourself: do you care more about saving money or having a better grip on your private information? 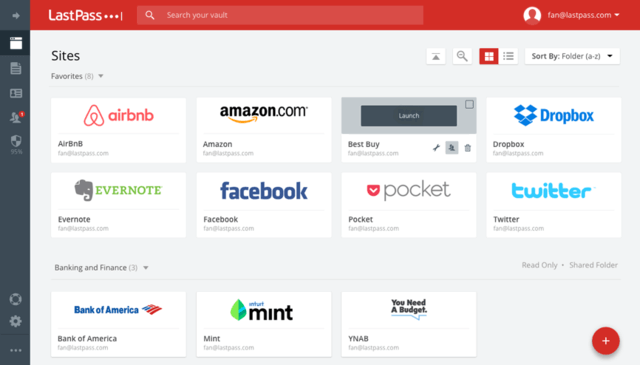 LastPass really is one of the best password managers for budget savvy shoppers. It has everything you need to keep all your private data (from passwords to licence codes) safe online, without over-complicating things. And you can even use it on all your devices for free, so long as you sign up via the app (most others make you pay for this must-have perk). It might not seem like much, but the alternative means losing your whole treasure chest of passwords the second you spill coffee on your laptop. Password managers don’t cost the earth, so we think this peace of mind is well worth it. Dashlane wins for almost everything else – you’ll save bags of time with features that let you change all your passwords at once, and you can count on premium support if ever you’re in need. Though the browser plug-in on LastPass just trumps Dashlane’s. Plus, if you’ve ever lost sleep over identity theft, you’ll be great friends with Dashlane. You stay in control of your data, and have the option of storing online or offline (it’s the cloud or the highway with LastPass). There are also extra perks like dark web monitoring and secure VPN that help protect you from fraud online, plus you’ll save time with automated features like the multi-password update tool. So if you’re just considering a free password manager, we think LastPass is the only one worth having. But if you don’t mind spending a bob or two on a programme that really makes your life easier, we think you’re in the best of hands with Dashlane because of how much time its features help you save. Dashlane is designed to be ultra user-friendly for the tech savvy as well as those of us who call for help whenever the computer says no. We found it the most easy-to-use platform we tested, and getting on well with your password manager helps you make the most out of its security. What’s more the number of automated functions on Dashlane means you can sit back and let it do all the legwork of keeping you safe online. It doesn’t get more user-friendly than Dashlane’s dashboard. LastPass users tend to rave about the product online, but if you do hear gripes, they tend to be about the user interface. Of course, if it were terrible, LastPass wouldn’t be a market leading password manager, but it’s still worth thinking about. Everything is easy to find in the dashboard, and the browser extension works seamlessly. But where Dashlane has an intuitive design, LastPass feels a touch more functional. LastPass is easy on the eye, but a tad less easy to use. Just looking for a trusty password manager without forking out too much? You’ll want to check out LastPass. Or, if you’re big on internet security, and don’t mind paying a little more for bumped up support online, Dashlane has your name on it. Now, let’s look at the features that set LastPass and Dashlane apart. Is LastPass just right for you? LastPass covers all the basics in password management – really well. As far as we can see, LastPass doesn’t actually one up Dashlane on any of its features. It’s really the number of features you get with LastPass Free that makes it such a great value password manager (you get all the above) – and that’s not to be sniffed at. So what makes Dashlane so great? Dashlane claims it’s the only app that prevents as well as protects you from digital identity threats online. It goes over and above what you’d expect from a password manager. You get extra online protection with features like dark web monitoring and secure VPN, in addition to all the time-saving tools to help you store all your your passwords safely. Both LastPass and Dashlane work on a freemium basis, with Free and Premium options. But which one is for you? Well, what’s your budget? If it’s between nothing and around £1.50 a month, go for LastPass. But if you can stretch to more like £2.50 a month, Dashlane will make it worth your while. LastPass Free: Is Premium worth it? LastPass Free offers one of the most generous free password manager plans you’ll come across, including all the features we listed above. 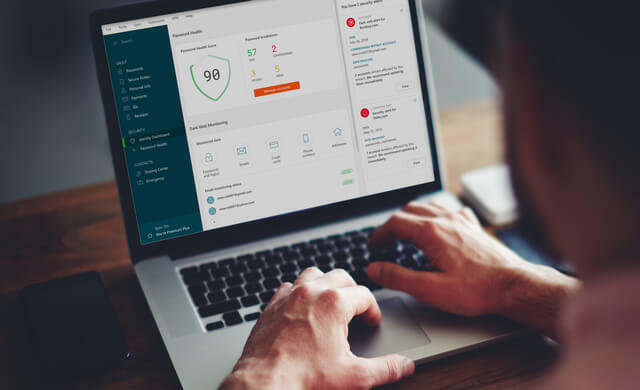 Dashlane Free lets you manage up to 50 passwords and auto-fill all your logins on any device of your choosing. Premium members get to manage unlimited passwords on any number devices, along with dark web monitoring and secure VPN. If the flexible syncing between your devices doesn’t sound like a biggie, trust us – it’s huge. Otherwise the impracticality and risk of losing everything is too great. When it comes to managing passwords on your phone, it’s good to know you’ve got a robust app making your life easier. Password manager apps work by auto-filling your passwords as you visit sites, so you don’t have to worry about being locked out, and they help keep you safe online. LastPass and Dashlane both have solid apps on Android and iPhones, but only LastPass currently caters for Windows Phones (Dashlane are still working on it). LastPass is one of the only password managers (apart from LogMeOnce) that lets you use it for free on your laptop as well as smartphone. Being able to sync your database across your devices is pretty invaluable. What if you’re travelling and want to log in somewhere? Or if you spill coffee on your laptop, you’re back to square one without an account back-up on another device. A couple of years ago, LastPass got everyone’s tails wagging when they announced they were finally making the app free, and we think it’s the only option if you’re not ready to pay. Now, just before you get too excited, a quick word of caution. LastPass is free if you get started on your phone. But if you’ve already installed it on your browser and want to sync with your smartphone, you’ll need to cough up for a Premium account, just like with Dashlane. In terms of app quality though, Dashlane takes the lead. It’s been voted a Best App on Google Play and it’s an Editors’ Choice on the Apple App Store. 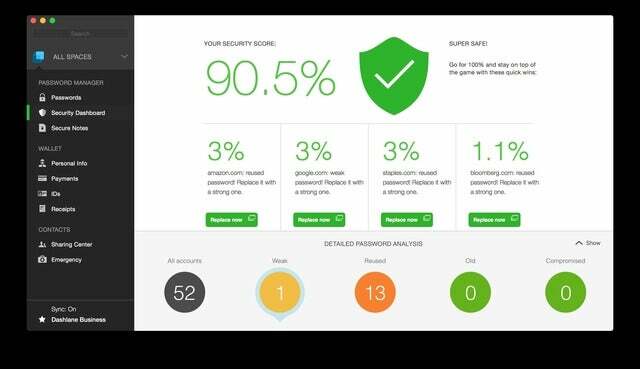 Some extensive testing by independent researcher Testfort also rate Dashlane a first-class password manager app. On each platform, you create a master password that will let you into your account. So long as the code you create is complex (don’t worry, you’ll get tips to make sure) and not reused anywhere else (just in case any less secure sites you visit are hacked), you can sleep easy. Just make sure you don’t forget that password, as not even LastPass nor Dashlane know what it is to help you out – this is so none of their staff can get their hands on your information. LastPass and Dashlane both use the gold standard in security: AES-256. This stands for “Advanced Encryption Standard” and is generally considered the highest level of data protection. It’s used by the military, banks and governments worldwide, and a recentMicrosoft report showed it would take all the computers in the world over a billion years to crack (basically it’s not going to happen). But Dashlane also goes one step further than LastPass: it prevents as well as protects you from cyber attacks. It actively scans the web for any leaks of your personal data and shields you from unsecure Wi-Fi connections. So, LastPass and Dashlane are fairly equal in terms of keeping your data safe. Yet Dashlane is still preferred by the more cautious among us. Why? Whereas LastPass forces you to share your (safely encrypted) data on the cloud, Dashlane lets you keep all your passwords local (just saved on your desktop, for example) if you’d prefer. This isn’t strictly necessary because LastPass decrypts your passwords locally anyway. But given the data breaches we keep reading about, many people just like the idea of bypassing the cloud altogether. For the ultimate flexibility in where you keep your database, Sticky Password lets you save everything online, offline and even on a USB. Though in our experience, all that action is more hassle than it’s worth, given how air-tight AES-256 security is. Most people find Dashlane a happy medium. In a nutshell, budget-conscious users will like LastPass because you so much bang for your buck. It’s free to sync your data across multiple devices (something most password managers charge for) – just make sure you start with the app on your smartphone, or you’ll be charged. But more cautious internet users will feel happier with Dashlane. LastPass makes all its users store their (encrypted) databases on the cloud, whereas Dashlane lets you decide what you do with your personal information: store it online or locally. As we said, both LastPass and Dashlane are fantastic password managers. So just go with the one that fits your budget and appetite for taking your data into your own hands. To try either for yourself, the best idea is to start a free trial of LastPass or Dashlane.